With the depression slowly engulfing more and more European nations, should you place your bets on Asia? It's easy to assess the growth of Asia since most of these countries are export hogs. Their GDP numbers, though correct, can mislead us into thinking that they have the answer to the crisis. Actually, they are all borrowing their way to growth, either through government debt or household debt or a combustible mix of both. Instead, a better indicator of their economic health is the level of their forex reserves (chart at left from The Financial Times). With the US current account deficits already slowing down, no country can expect to increase its forex reserves. Now the three major South-east Asian economies of Indonesia, Thailand and Malaysia have started running down their reserves while Asia's two major powers, China and India are seeing their reserves increasing at a slower pace. China is the worst of the lot, with all sectors of the economy heavily in debt. 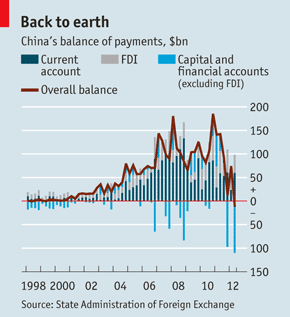 China's latest balance of payments (chart at left from The Economist) confirms that even its forex reserves have started to decline mainly because of capital flight, a problem you'd usually associate with Greece or Spain. Do the rich Chinese know something which the China bulls are still in denial of? If you think that you can sleep soundly after moving your investment to these countries, you'd better put on a pair of good earmuffs. There are still many shoes waiting to drop.